– Distance from Strip: 3 – 5 Min. Daylight Savings Time begins on March 11th, 2018 and ends on November 4th, 2018. 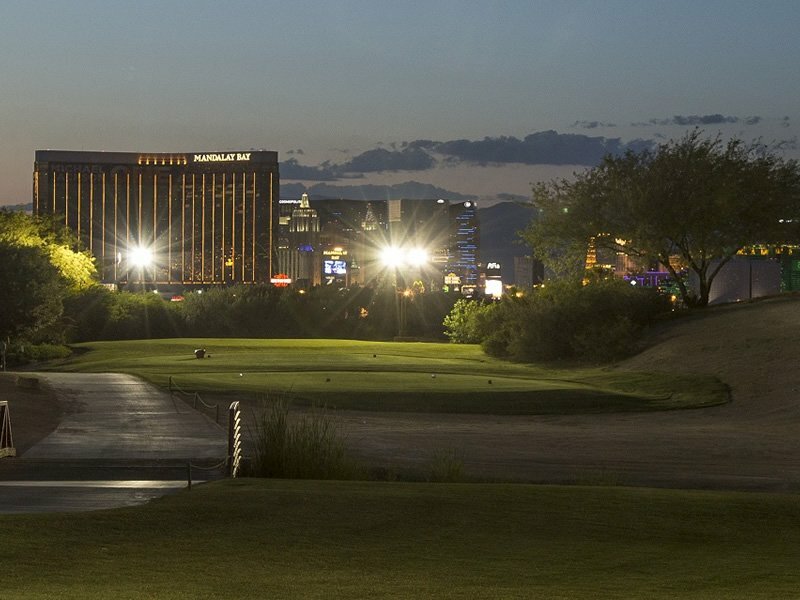 With late twilight times and early sunsets November-January in Las Vegas, it is unlikely you will finish your round prior to sunset. Please give your group at least 4 1/2 hours to complete all 18 holes using the chart below as a reference for the sunset on your golf days. Twilight and Super Twilight times are not guaranteed finishing times. 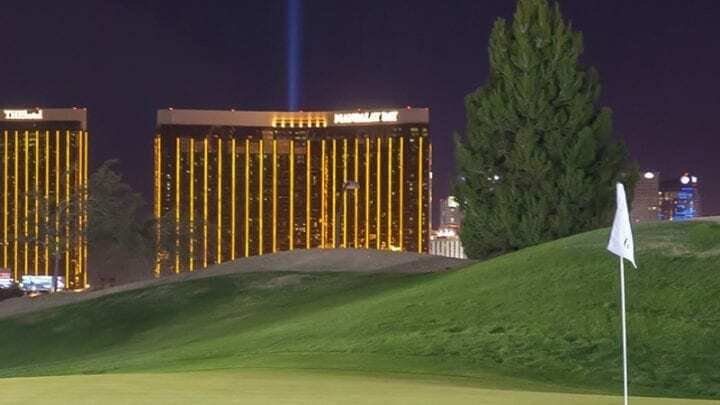 Being on some of the most expensive land in the city with the best views of the Las Vegas Strip, the Las Vegas Golf Center (formerly the TaylorMade Golf Experience) is located on S. Las Vegas Boulevard, about 5 minutes south of the Mandalay Bay Hotel on the Las Vegas Strip. It is one of the most well-liked and easy to get to practice facilities in the city. The entire facility is lighted for practice until 10:00pm generally year around. 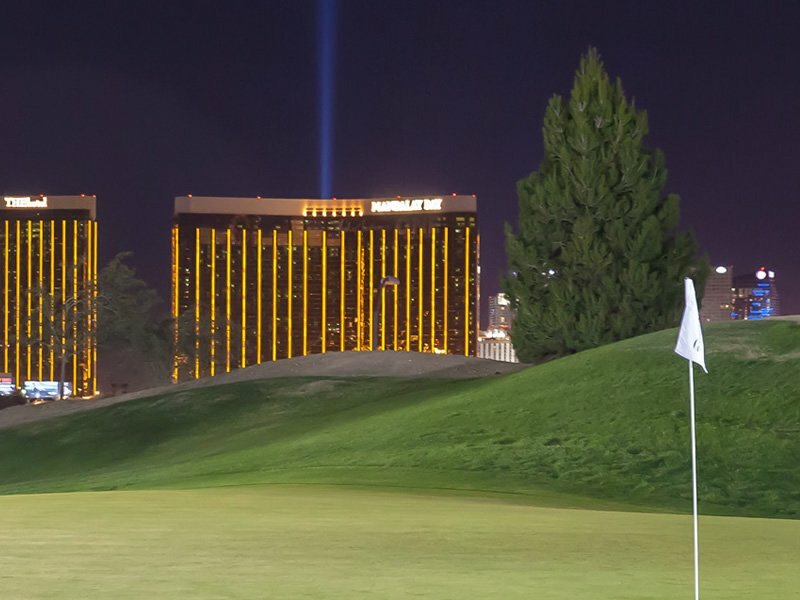 There is also a par-3 short course, with lights for night play as well, called the Divine Nine. The last tee time is taken around 9:00pm (PST). Built in 1997, by legendary Bob Cupp, 1992 Architect of the Year, the par-3 Divine Nine short course is great fun for the entire family. The course is accented with hilly terrain, waterfalls, creeks, and well-place bunkers. 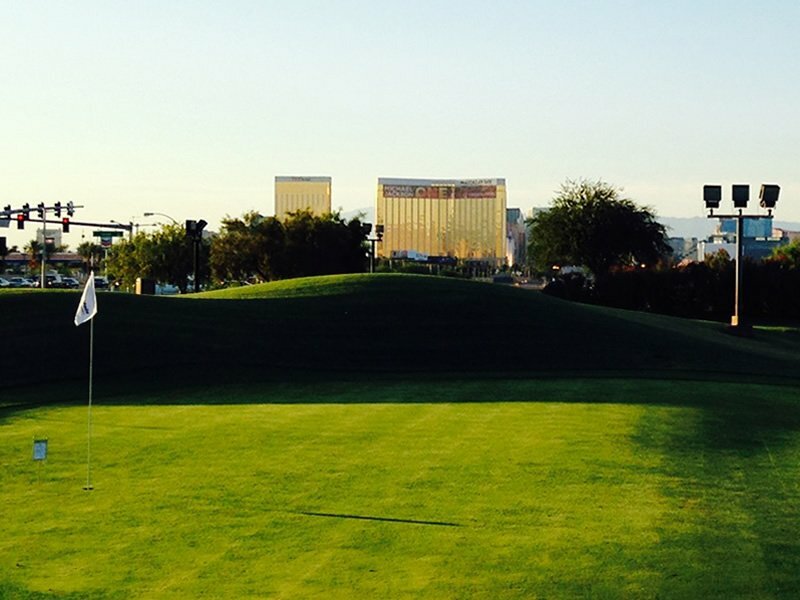 Ranging anywhere from 100 yards to roughly 190 yard, you can leave your driver at home. This course is strictly for your iron play and short game, which is what makes a good golfer score low. 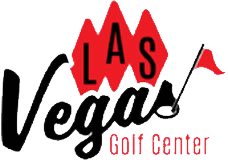 The Las Vegas Golf Center has been repeatedly rated by VegasGolfer magazine as the Las Vegas Valley’s best practice facility. With any of the certified Class "A" PGA Professionals on staff, a golfer can get anything from a “Quick Fix” to a playing lesson on the par-3 Divine Nine and then have the lesson emailed back to the student available for download. 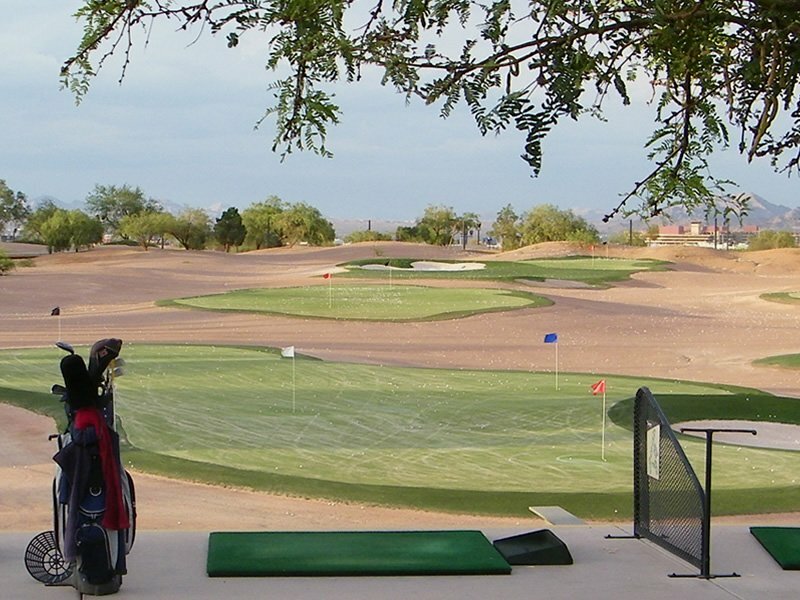 With a two-tiered driving range and over 100 stalls, the facility can handle many golfers at one time. 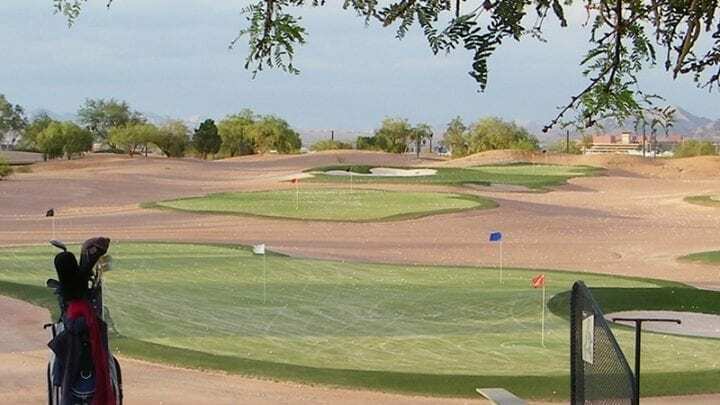 The two-tiered section uses mats for the hitting conditions, but for player that wants the true feeling of grass between the club head and the ball, he/she can pay a little extra and use the real grass tees. The facility also has a practice putting green and chipping green with a deep sand bunker to hone in on your short game. 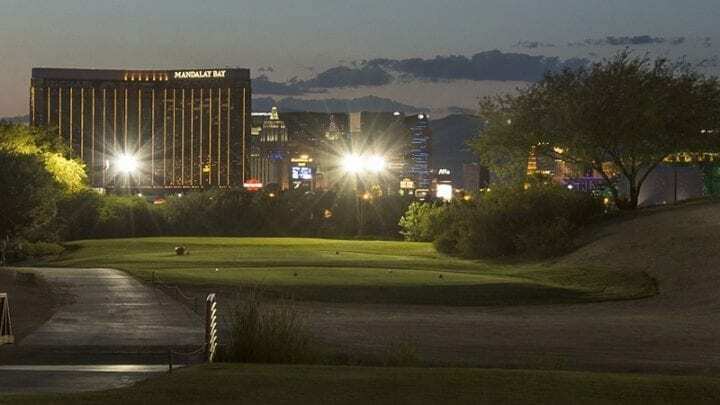 Inside of the facility there is one of the largest golf shops you will ever see which sells the most clubs in the nation, the Las Vegas Golf Center. 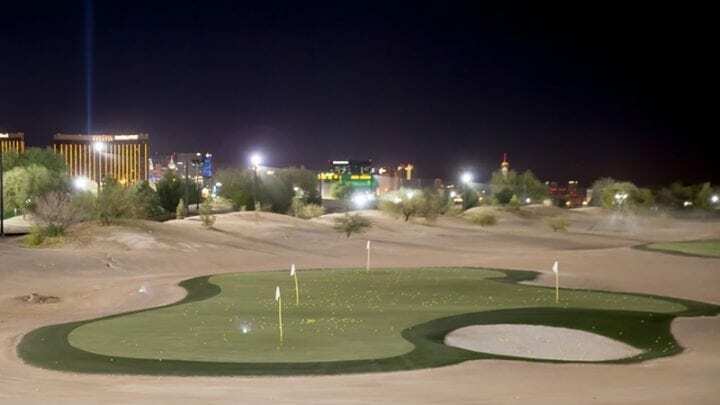 With a Authorized Fitting Center, and a huge stock to cover, the facility offers on-the-spot custom club fitting where you can get a fitting and usually leave with your custom fitted clubs. If not, have them shipped directly to your front door for a small additional fee. The merchandise is endless. 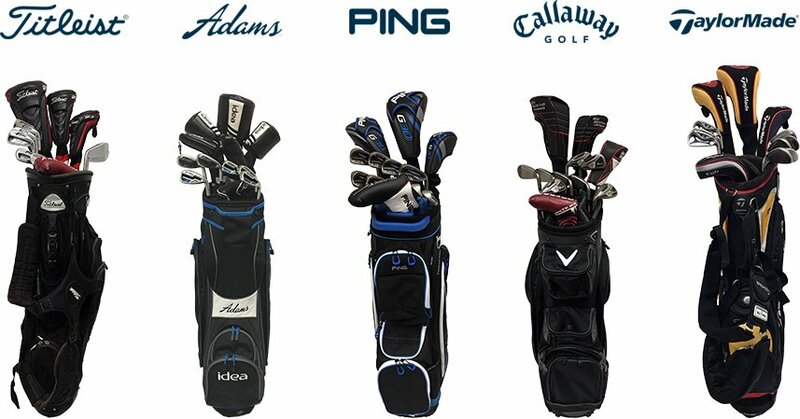 With everything from custom clubs to junior set, to shoes and rain suits, you will not leave empty handed. It is also a great place for gifts and knick-knacks for the passionate golfer in your life. 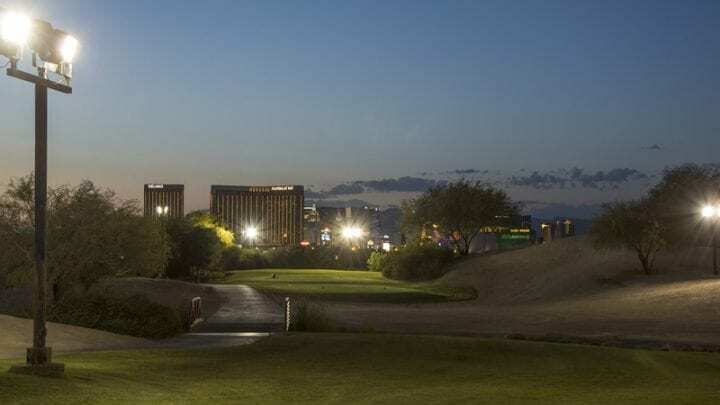 With the new addition of the Back Nine Bar & Grill, you can stop in for a quick bite or have a drink at the bar after your round or your long day of practice. With all of the golfers’ favorites from a BLT or Hot Dog, to an Arnold Palmer or Corona, it is a perfect little venue to sit down, watch some golf on TV and relax. With a full wall of windows that face the strip and airport, the views are phenomenal as there is always something that will catch your eye. 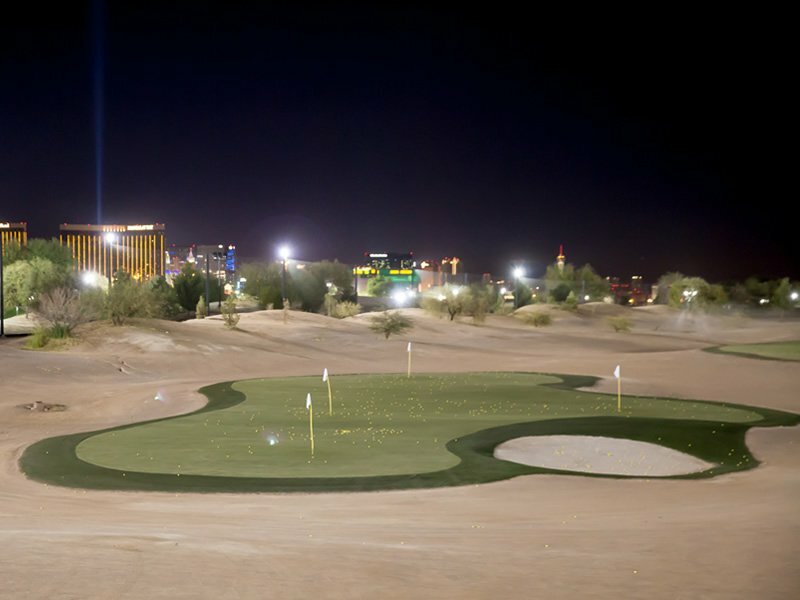 The Las Vegas Golf Center is located on the Las Vegas Strip, just past the airport, about 5 minutes from the action. 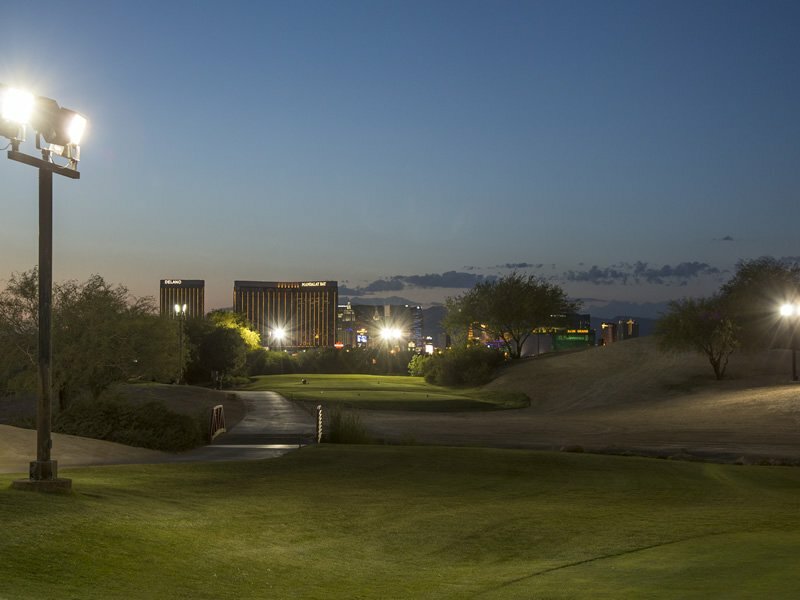 If you do not have time to play a full 18 holes, give the par-3 Divine Nine a try or simply stop by to hit some balls and test out the latest clubs. Clothing that is not appropriate includes: denim shorts, denim jeans, t-shirts, swimming attire, gym shorts, halter-tops, tank tops, cut-offs and other dress that is deemed inappropriate. The Club reserves the right to refuse service to anyone who is dressed inappropriately. Non-metal spikes must be worn while on the course. 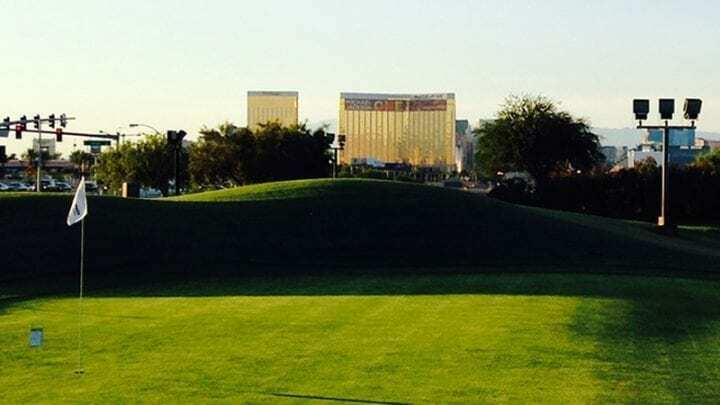 © 2019 VIP Golf Services.